KSM-66 is a proprietary brand of Ashwagandha supplement that is certified organic by USDA and is manufactured according to the highest quality standards. KSM-66 has also been studied clinical trials for stress, cognition, sexual health, physical performance and more. According to the manufacturers Ixoreal Biomed, KSM-66 is the highest concentration full spectrum Ashwagandha extract sold today, sourced only from the roots of the plant. It contains more than 5% withanolides, which is the primary active ingredient in this plant. KSM-66 is the brand of Ashwagandha used by the company 88Herbs.com in their single-ingredient Ashwagandha supplement. 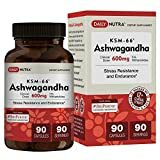 This supplement contains 300 mg of premium grade Ashwagandha extract per capsule and is available to purchase online at this link. The following is a guest post from Andrew Best, the Senior Partner at 88Herbs.com. Continue reading to learn more about what makes KSM-66 Ashwagandha different from other brands and how to look for high quality ingredients in the supplements you are buying. Disclaimer: Information contained in this review is the opinion of the respective author and not Nootriment.com. Many people know that ashwagandha is an incredible herb for reducing stress, increasing stamina, improving cognition, as a sleep aid, and a whole host of other conditions. Sales of ashwagandha have been steadily increasing because more and more people are realizing how effective this supplement is. Unfortunately, a lot fewer people really give much thought to the type of ashwagandha (or any supplement) they are getting. They may think about price and the number of milligrams in a capsule, but that’s about it. I want to share with you some of the differences between different types. First of all, you need to understand the potency of the ashwagandha you are getting. This is generally measured in the concentration of the active ingredients – the withanolides. The withanolides work to balance the body’s hormonal system and bring it back to homeostasis. The withanolides also reduce the “stress hormone” cortisol – most of us have far too much cortisol. This helps lower our stress and anxiety levels, sleep better at night, and feel better during the day. Some manufacturers of ashwagandha will just mow down an entire field of ashwagandha, grind it all up, and mix it together. The issue here is that often the strength will be quite weak, because most of the active ingredient content is found in the root and not in the rest of the plant. And even then, the active ingredients need to be extracted from the root in a highly concentrated way. The ashwagandha also needs to be of a high quality strain, grown in proper soil, watered properly, receive enough sunlight, etc. Another thing you should look at is whether the ashwagandha is certified organic and Non-GMO. You want to be sure that there aren’t a lot of chemicals, heavy metals, or other toxins in the finished product. A third issue is how it’s encapsulated. Do they use unhealthy fillers such as magnesium stearate? Do they mix different grades of ashwagandha together or just use one type? What type of capsules do they use? A fourth is scientific studies. There have been a lot of scientific studies done on ashwagandha. But each study will use one type of ashwagandha when they do it. So if a very potent form of ashwagandha used in a study yields a certain result, it doesn’t mean that any random brand you purchase will give you those same results. Quality matters – and the qualities vary widely between different types of ashwagandha. Full Disclosure: My job at 88Herbs is to look for the best quality of any supplement before we source it and put it on the market. That’s what we do with every ingredient in every product we make. Before we launch any new ingredient, we actually order the raw material from several different suppliers and run our own tests in-house. We first get our team to try each ingredient ourselves and figure out which is the best. We then do 3rd party lab testing to ensure the purity of the product. Finally, we pour over the scientific literature from each ingredient supplier on each specific product. When we find something that really stands out as the best, we take the next steps to put it on the market. For ashwagandha, I’ve found that the KSM-66® ashwagandha we use is the best on the market. It’s certified organic and Non-GMO. It is very high in active ingredient content (5% withanolides). We don’t use magnesium stearate or any unhealthy fillers. We use pure KSM-66® and put it directly into vegetarian capsules. The majority of the research being done on ashwagandha is done specifically on the KSM-66® we use – which is one major reason why we decided to use it. We are based in Canada – although we sell our products all over the world. The regulatory environment in Canada is a lot stricter for health supplements than in the USA. In order to make any health claims here, Health Canada needs to review the science on any particular ingredient before allowing it. KSM-66® got Health Canada’s approval for claims involving stress reduction, sports nutrition benefits, healthy testosterone production in men. There are several ongoing studies with KSM-66® and new health claims are being added all the time. This is not at all the case with a generic form of ashwagandha. KSM-66® ashwagandha is gluten free, vegetarian, Non-GMO, Kosher, certified organic, and Halal. It has won several awards including the Frost and Sullivan “Product Innovation in Botanicals” award, the “Best Botanical Ingredient” award at Natural Products Expo West, and the Innovative Ingredient of the Year award” at Panacea. If this is your first time trying ashawagandha, or if you’ve tried other varieties in the past, I highly recommend trying out our ashwagandha and experiencing the difference first hand. We ship it quickly and use very fresh batches every time. Click here to Purchase KSM-66® Ashwagandha from 88Herbs.com. Where is your Galantamine come from ? is that importing from USA ？how to purchase ? do you have white kidney extract ?